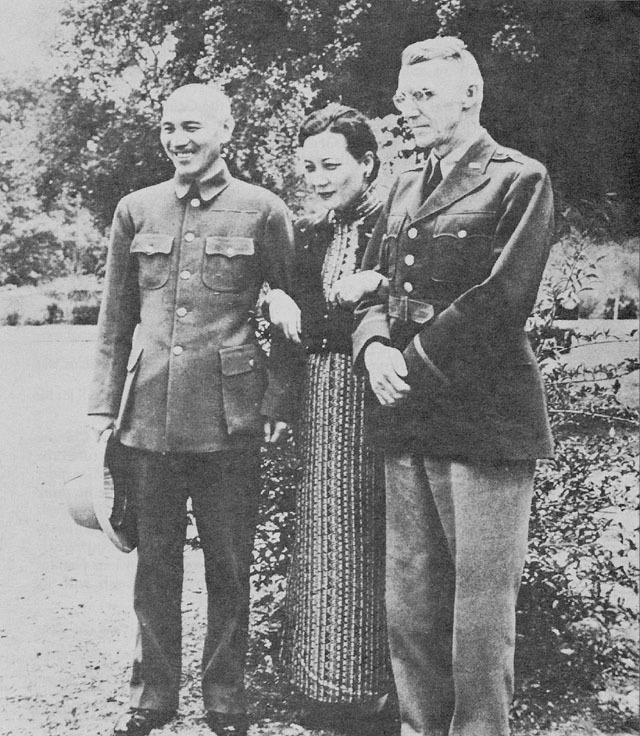 When Stilwell conferred with the Generalissimo and Madame Chiang on 1 April he could not charge a clear, apparent repudiation of the Soong-Stimson accord on command, for he was faced with something else. The Generalissimo had given Stilwell command of the Chinese Expeditionary Force in Burma and then treated Stilwell exactly as he did his other army commanders. The Generalissimo believed in exercising the most detailed command from Chungking, on the basis of information which he received days late over an uncertain communications net.1 And so he had sent radio after radio and letter after letter to his commanders in Burma--some bypassing Stilwell, some going to him. The Generalissimo's March 1942 letters to Stilwell have not survived, but Stilwell's description of them suggests they were like those of April and May 1942, which are available: "They direct all sorts of action and preparation with radical changes based on minor changes in the situation. "2 The result was that Tu had ignored Stilwell's orders, and that Alexander, to whose supreme command in Burma the Chinese had agreed, was in fact unable to exercise that command. CONFERENCE AT MAYMYO, BURMA. Generalissimo Chiang Kai-shek with Lt. Gen. Joseph W. Stilwell, 9 April, 1942. "Chief of Staff, Headquarters of the Supreme Command of the Allied Forces, China War Theater." While the Chinese were insisting on the holding of Allanmyo and Stilwell at Pyinmana was awaiting the chance to launch his attack, the British commanders in Burma had been thinking of still further withdrawals. On 3 April Wavell radioed the War Cabinet that 1 Burma Corps would probably have to fall back to Magwe, about twenty miles up the river beyond Minhla, because the position they held was untenable. He was not hopeful of the situation in Burma and was considering the various evacuation routes. Next day, at Wavell's request, Alexander submitted his own estimate in equally dark terms, for he thought a gradual withdrawal northward inevitable, with the Allies covering Mandalay as long as possible. To complete the picture, Brereton submitted a similar estimate.12 Since Wavell and Alexander took this attitude, it is hardly surprising that, though there was no Japanese pressure, between 3 and 8 April 1 Burma Corps fell back from about Allanmyo to the line Minhla-Taungdwingyi. Though the Japanese Air Force was usually much in evidence in those dark days, there was no contact with their ground forces. divisions.27 Actually, the only major Japanese unit in the whole of Indochina and Thailand was the 21st Division, at Hanoi, French Indochina. In early 1942 the Japanese held those countries with small garrison forces. The British liaison officer with the 6th Army invited Kan's attention to the scattered state of his divisions and the absence of a central reserve. The proposal to remedy these defects bogged down in administrative formalities, Kan saying that higher authority had made the dispositions, which he could not change, and when he agreed that the matter should be referred to Headquarters, Army in Burma, that body replied no Japanese threat was anticipated. This was an unfortunate state of affairs because the Temporary-55th Division was the principal obstacle to the revised Japanese plan for the encirclement and annihilation of Burma's defenders.28 Since a Chinese document taken at Toungoo said the principal Chinese forces would seek a decisive engagement south of Mandalay, the Japanese decided to make a final revision of their operational plan to aim at a gigantic encirclement of Burma's defenders south of Mandalay and Lashio. 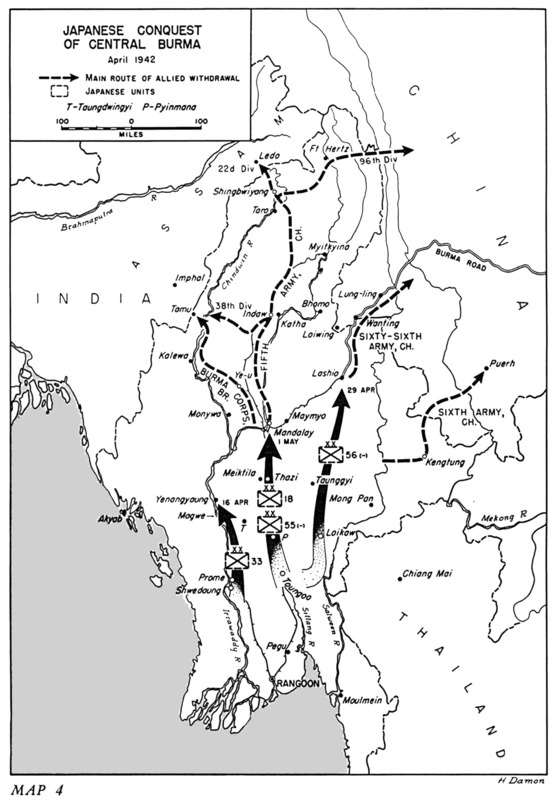 The revised 15th Army operational plan, issued at Toungoo on 3 April, called for the use of all its divisions, directing the 56th on Lashio, the 18th and 55th on the east and west suburbs of Mandalay respectively, and the 33d up along the Irrawaddy's banks, sending one element to the Mandalay plain and another to Bhamo. For its mission the 56th Division was heavily reinforced with the 14th Tank Regiment and two battalions of artillery and was made mobile by the attachment of ample motor transport. If weather permitted, airborne troops would seize Lashio.29 The Japanese thus aimed at a double envelopment. Lashio was the goal, for its capture, cutting the Burma Road, would go far to isolate China and to prevent a retreat by the Chinese forces in Burma. Special attention must be given to the enemy forces in the Mawchi sector. If they are a regiment in strength it would seem that our division under Gen. Ch'en Mien-wu will not be equal to the task of repulsing them single-handed. It is my view that if the enemy is not genuinely taking the offensive against the center of the 5th Army a detachment of mechanized troops with tanks and mounted artillery [sic] should be despatched to assist General Ch'en's division in destroying the enemy forces at Mawchi. The security of our rear may thus be safe-guarded. This will certainly be the soundest course. At Stilwell's headquarters, his G-2, Colonel Roberts, had been for some days concerned over his inability to locate the third regiments of the 33d and 55th Divisions. When the Chinese reported this series of contacts on the east flank of the Allies' central concentration, Roberts was alarmed. Because of the pressure under which Stilwell was then working, Roberts had to raise the issue at mess, suggesting that this was one of the missing regiments and that its goal was Lashio. Stilwell immediately appreciated the menace and called a conference with Tu and their staffs on 9 April. On 11 April Stilwell visited the 6th Army, where it was now known a Japanese blow would fall though incomplete order of battle data on the Japanese led to a very serious underestimate of its weight. I recommend that General Kan, CG, 6th Army be reprimanded. He does not control the actions of his division commanders. He has moved, without orders, units under the control of the Zone Commander. He does not keep sufficiently informed about the military situation, or the care and supply of his troops. I recommend that Gen. Ch'en Li-wu, CG of the 55th Division, be relieved of command at once. He has no control over his division. He has already withdrawn, without orders, before an inferior Jap force, and needlessly given up vital ground. While these attempts were being made to bring aid to the Temporary-55th Division, its 1st Regiment, which was falling back after its earlier defeat by the Japanese, was overtaken by them and further punished, while the 2d Regiment, Temporary-55th Division, which had been moving south, was taking up defensive positions on the Htu Chaung Creek. Here followed a brief pause in which the Temporary-55th Division was content to remain passive in bivouac along the road. The Chinese troops were suffering severely from thirst, and the energetic British liaison mission with the 6th Army tried to bring down truckloads of fresh water. This ended when the Chinese promptly confiscated the trucks. Colonels McCabe and Aldrich, Stilwell's liaison team with the 6th Army, pleaded with Kan to counterattack, or at least to patrol aggressively. They had no success, and a strange sort of truce settled on the battlefield. The Japanese put it to good advantage.41 While the Temporary-55th remained passively in bivouac, the 56th Division sent company after company toiling through the woods parallel to the road on which the Chinese camped. Meanwhile, Tu goes to Kyaukpadaung, and there is no one to direct the 96th and 22d. Lo goes to Maymyo and there is no one to direct the 6th Army. Lo confers with Alexander and Lin Wei and I do not know what they have decided to do. Slim wants to turn the whole thing over to Tu, and so does Alexander. Somebody has to control the mess and I am the goat. Lo sends word by Chiang that he has decided to go to Kyaukse because the phone service is good, and asks me to go up there, tomorrow night. He may not or does not know even now what is happening to the 6th Army and the 96th Division. What I have ordered may be the exact opposite of instructions he may be putting out. I have sent Chiang to get him and bring him back here at once, urgent. Kan by radio, and, finally, slowly complied with the order. This excellent division never had a chance to display its worth in battle, but it retreated to China in good order.51 At the time this withdrawal was not known to Stilwell or Lo. Alexander's and Stilwell's problems at this point in the campaign fell naturally into three parts. Only the first two were similar for both commanders. Each had to conserve his forces as far as possible. Both were ordered to protect communications across north Burma from India to China. But Alexander's further responsibilities lay toward India, whereas Stilwell's mission was to support China. Stilwell's thoughts in the latter days of the campaign, up to the time when the Japanese cut him off from the north, were shaped by the concerns he shared with Alexander, plus the plan he conceived in early April to carry out his mission to China. which an improved Chinese Army could grow. The Chinese force would be organized into two corps of three divisions each. Selection of Commanders and Personnel.--Selection of Chinese officers up to the grade of regimental commander, non-commissioned officers, and men to be made in accordance with policies personally dictated by the Generalissimo so as to insure the availability of personnel of the highest type suitable to handle the technical equipment involved. Carefully selected Chinese officers will be used from the outset in all grades up to and including regimental commander. Higher commanders and principal staff officers initially to be American officers until such time as Chinese officers can be substituted. To move these men to India, Stilwell proposed they be concentrated about Kunming in order to begin their move about 15 May 1942. From Kunming they would march or be flown across north Burma via Myitkyina-Mogaung-Shingbwiyang to Ledo. The immediate and obvious objection to the plan as it appears is the difficulty of moving the Chinese troops from China to India. Stilwell wrote: "Movement to railheads in India to be made by marching with such assistance from highway transport organizations and the U.S. Air Freight Line as may be practicable. . . ." Any such marching would have to be done during the monsoon rains over dry-weather roads and pack-horse trails. 1st Phase--Recapture Burma; the decisive effort to be made from India, a secondary effort to be made from China and the northern Shan States. 2nd Phase--Eject the enemy from Thailand. . . . . to cover the communications between India and China. 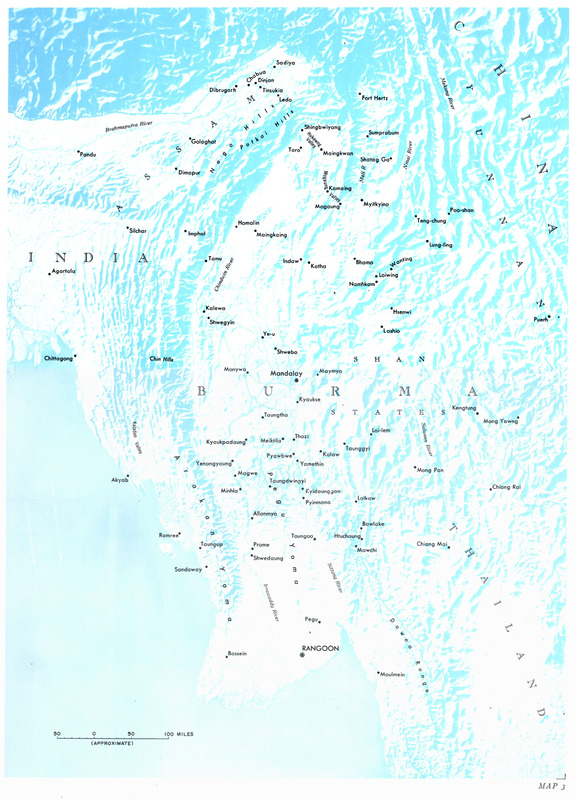 A withdrawal North of Mandalay will cut the LOC [Line of Communications] via the Chindwin, Mandalay, and Lashio. In the event of such a withdrawal it will be necessary to cover the broken ends of the communications with India and China via the above route and also to cover the projected route between India and China via the Hukawng Valley. The order stated that because of the bottleneck in communications at Mandalay and the need to protect the Chindwin and Shwebo routes, British forces and the Chinese 38th Division would not become involved in close defense of Mandalay. It further directed that Headquarters, Army in Burma, would move on the axis Shwebo-Mandalay. Below Mandalay the course of the Irrawaddy River placed it directly across the Allied line of retreat, and only the Ava Bridge offered a ready crossing, a situation which, as the Allied forces crowded against the river, must have seemed uncomfortably like that on the Sittang in February. So, on 25 April after a conference with Stilwell, Alexander ordered a withdrawal to the north bank of the Irrawaddy, to begin that night. On the same day tanks and trucks of the 5th Army could be seen moving north through Lashio to China, passing troops of the 66th Army stolidly moving into Burma. The evacuation of the 5th Army was without Stilwell's orders and was the beginning of the collapse that rendered futile any hopes of holding Myitkyina and the trace of the Ledo Road.60 On 26 April Alexander decided that the fall of Lashio would be a matter of days. A Japanese thrust from Lashio via Bhamo to Myitkyina would make any stand north of Mandalay futile, and so the defense of India would have to be his major consideration. The general withdrawal to the line indicated by Alexander on 29 April was ordered for 2 May; the Chinese forces in the eastern half of Burma were already in full movement back to the Salween River, whose mighty gorge was the natural defense line of southwestern China. Stilwell's and Alexander's hopes of a stand across north Burma began to vanish as the Chinese streamed out of Burma. The aircraft that was to take Stilwell to eastern Burma failed to arrive on time, and Loiwing, his intended destination, was evacuated that same day. Gradually, Stilwell was being driven to the conclusion that he could exercise no control over the Chinese armies and that evacuation of his personal staff was his next problem. For the Chinese divisions that went east, the campaign in Burma merged into a fight to keep the Japanese out of China; but the Allied forces that withdrew into India could halt there without an invading army on their heels. An invasion of India was not scheduled, and the 15th Army halted its pursuing forces on the borders of India. Alexander's hopes of keeping a foothold in Burma had to yield to India Command's belief that it could not maintain his forces there. The withdrawing imperial forces had to fight two engagements as they fell back. The 215th Regiment, 33d Division, occupied Monywa, across the withdrawal route, on 1 May, overrunning the Burma Division headquarters and taking all its code books. The 63d, 13th, and 1st Burma Brigades fought their way into town so that the transport could bypass the town on cart tracks and head north to Ye-u, where all the tracks for the Chindwin River began.70 The 1st and 2d Burma Brigades made their separate ways to the Indian frontier. The rest of the army marched to the river port at Shwegyin where it fought off the pursuing 213th Regiment, which came up while embarkation was in progress. The Generalissimo's orders for the 5th Army changed again on 18 May, and the 5th was ordered to "take position" between Myitkyina and Fort Hertz. At one time it had been within a few days' march of the Indian border (Manipur State) and safety, before veering north toward China.74 At this time the 5th Army was the 22d and 96th Divisions, headquarters and army troops, and assorted stragglers. The two divisions parted company. Survivors of the 22d Division emerged in the Ledo area in July and August, having made good their withdrawal over the ghastly "refugee trail." The local British area commandant estimated that about 30,000 persons essayed the refugee trail, of whom 23,000 succeeded. Months later the bones of those who failed were whitening the trail, in many places literally so. The first civilian refugees and Chinese troops lived off food stores accumulated for coolies working on the Burma side of the Ledo Road. The local Kachin tribesmen were very charitable and gave freely of their stores. When these were gone, looting by the refugees began. The American and Royal Air Forces dropped food in the Hukawng and Mogaung Valleys on a large scale. One hundred and fifty tons of supplies were dropped at Shingbwiyang between 29 June and 12 August and a total of 132 tons at other points along the trail for the 5th Army and 22d Division alone. Colonel Boatner, who surveyed the area, believed there was no shortage of food after the Chinese reached Taro. Moving directly to India to arrange for the reception of the Chinese divisions which he expected to follow him, Stilwell led a heterogeneous group: the small staff which he had kept after moving the bulk of his headquarters out to China and to Calcutta, the Seagrave ambulance unit with its nineteen gallant Burmese nurses, the Friends Ambulance Unit, a Chinese general with his bodyguard, a group of British officers, a newspaperman, nine mechanics, and three civilian refugees. Stilwell had undisputed command and used it to bring his people through the jungles quickly and in good health. No detail of command was too small for his attention. Akyab, on the Bay of Bengal, was evacuated on 4 May by the 14/7 Rajputs, placed there in late January to keep the Japanese from using its airfield as a base from which to bomb Calcutta. Two more battalions went there on 18 March and were taken out shortly after because of the Japanese occupation of the Andamans. Heavy Japanese bombings in late March affected civilian morale, malaria began to make serious inroads on the garrison, and nationalist sentiment was increasing sharply. A strong force of Japanese-led Burmans with artillery was reported on the mainland at the end of April, and this, added to the other circumstances, made withdrawal of the battalion appear advisable. Akyab was occupied soon after. WITHDRAWAL FROM BURMA. 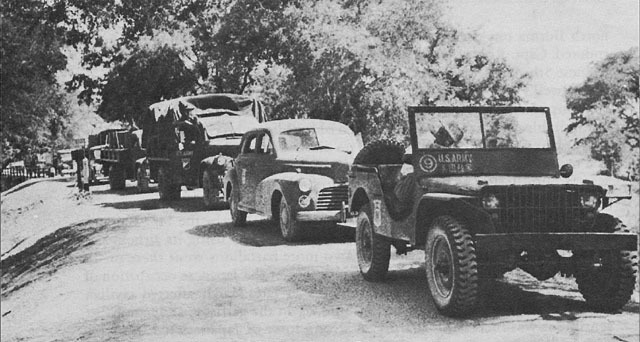 Convoy on the road en route to India, above. 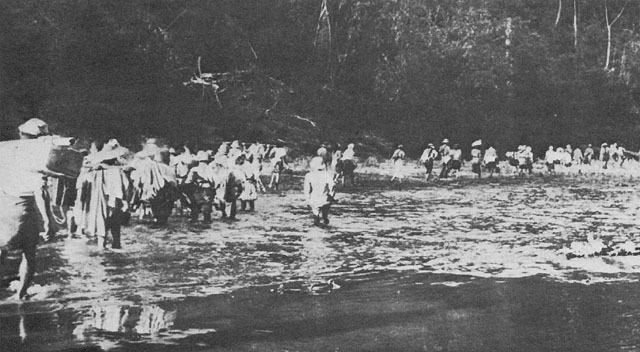 Below, the Stilwell group walk up a river after abandoning their vehicles. WITHDRAWAL FROM BURMA. General Stilwell, followed by two aids, Lt. Col. Frank Dorn and 1st Lt. Richard Young, leads the way through the jungle above. Below, a brief rest is taken at a campsite. Left to right, Capt. Paul L. Jones, Lt. Col. Frank D. Merrill, Col Robert P. Williams, and Col. Adrian St. John. Around and between these racing columns with their infantry in trucks and with tank spearheads, the 28th, 29th, and 200th Divisions were fighting and marching their way to the Chinese border. The adventures of the 200th Division were especially notable. Its successes in the Taunggyi area were made futile by the capture of Lashio, but the 200th Division, plus half of the 2d Reserve Regiment and two battalions of the Temporary-55th Division, was still in Taunggyi on 6 May. That day the 200th Division received conflicting orders from the Generalissimo and General Tu. The division commander obeyed General Tu's order and marched on Myitkyina, which lay many miles to the north.81 While trying to make its way through a mountain pass, the division came under Japanese rifle fire. The commander, the same General Tai who fought so well at Toungoo, was wounded and died soon after. The division turned back and took an easier route.82 This led the 200th Division toward Bhamo, in which vicinity it turned sharply east and made its way over the mountain paths to China. In effect, the 200th had cut right across the Japanese lines of communications and made its long journey behind Japanese task forces that were fanning out along the Yunnan border, many miles to the east. scattered between Lashio and Lung-ling, with the rest of its personnel north of Lung-ling. By 15 May it had collected itself and moved east of the Salween. The terrain in this section of the world lent itself well to such cross-country escapes, for by moving at night, troops could escape aerial observation, and the Japanese by day could not see through the sheltering mountains. Moreover, the Japanese could not be present in great force everywhere, and there must have been many gaps through which hardy and determined men could find a path. The 29th Division on 4 May was badly defeated at Wanting and soon had one regiment and two battalions scattered south of Wanting, with the rest of the division north of Lung-ling. The lower Salween country was occupied by Japanese and Thai troops--the 56th Regiment, 18th Division, from Loi-lem in Burma, the others north from Chiang Rai in Thailand. There was some fighting in the Kengtung area. After three days the Generalissimo intervened and ordered the Chinese 6th Army, of which only the 49th Division was fighting, to fall back on Puerh, China. This it did at once, thus bringing the 49th and 93d Divisions back to Chinese soil. The Japanese followed, taking Kengtung on 28 May, and advancing on Mong Yawng, fifty miles east, on 30 May. On the southern Salween front the Japanese were thus moving on in the full tide of hot and successful pursuit, but on the northern portion of that enormously long front, 250 miles away, the Chinese had halted, rallied, and mounted a counteroffensive with six divisions. 1. The Generalissimo described his system of command to Stilwell some months later in a conference, 24 June 1942. See Min (Chinese version), Conf, Stilwell and Generalissimo, 24 Jun 42. Stilwell Documents, Hoover Library. Stilwell's appraisal of the system, based on experience of it, is on pages 77-78 of The Stilwell Papers. 2. (1) Quotation from The Stilwell Papers, p. 76. (2) Upon his return to the United States in 1944, Stilwell filed the Generalissimo's letters of April and May 1942 in three folders which are now in the Hoover Library. One group is in SNF-12; one is a folder labeled CKS Correspondence; and the third is an inclosure to General Lo Cho-ying's account of the First Burma Campaign in SNF-12. (3) "The Generalissimo, however, is the military commander in chief of the Chinese forces and it is his custom to give direct instructions to his divisional commanders. He sees no impropriety in this. In fact he actually gave me some of his communications to his divisional commanders in Burma, obviously expecting me to concur in their propriety and reasonableness. These communications, however, were direct orders and had the effect of completely undermining Stilwell's position as Commander-in-Chief in the field." Rpt, Dr. Lauchlin Currie, sub: Rpt on Visit to China, 24 Aug 42. OPD 336 China (24 Aug 42) F/W 111, A47-30. 3. (1) The Stilwell Papers, pp. 76-80. (2) Stilwell Diary, 1 Apr 42. (3) Stilwell B&W, 1 Apr 42. 4. (1) Stilwell Diary, 2 Apr 42. (2) Stilwell B&W, 2 Apr 42. The British-trained Kiangsi troops were in the 32d Group Army under the command of Lt. Gen. Li Mo-an. 5. (1) Ltr FAB 66, Gen Shang to Magruder, 15 Apr 42. Stilwell Folder, China 1942, Stilwell Personal Papers. (2) Stilwell Diary, 4 Apr 42. Editor White's passage on page 116 of The Stilwell Papers omits Stilwell's recording on page 49, Stilwell B&W, of the fact that he received the chop as chief of staff instead of one proper for the commander in chief of the Chinese Expeditionary Force in Burma. 6. (1) The Stilwell Papers, pp. 82-83. (2) CM-IN 2406, Stilwell to AGWAR, 7 Apr 42. (3) The Campaign in Burma, p. 30. On 8 April 1942 Tu was at pains to announce that Lo now commanded. (4) Rad, Marshall to Stilwell, 3 Apr 42. AG 381 (12-19-41). 7. Rad AG WAR 448, Stilwell to Stimson and Marshall, 3 Apr 42. Item 5, Bk 1, JWS Personal File. 8. (1) Interv with Brig Gen Frank N. Roberts, 25 Apr 51. (2) Rad CHC 1241, Stilwell to Marshall, 3 Jul 44. SNF-131. (3) Stilwell's cryptic comment is: "Use of Reds: 1942--No. Later attempts. No. Use of Cordon troops (Hu /Tsung-nan?/). No. Finally 1944--a few units grudgingly moved through fear for Kunming." The passage is from a paper found among his miscellaneous writings, which begins with the passage, "Mission.--Raise efficiency of Chinese Army for participation in the war. Chiang Kai-shek failure to carry out . . .," and ends, "No support anywhere. Chinese could not believe Chinese troops could fight the Japanese. No interest in Ramgarh or in Burma." Stilwell Papers, Hoover Library. (4) No other references to this episode have been found by the authors in any source examined by them. 9. (1) Notes by Col. Frank N. Roberts, as collated by Capt. John LeR. Christian. MIS Folder, Burma Campaign, MID Library. (2) Foucar, pp. 202, 224. (3) The Campaign in Burma, pp. 30, 31. 11. (1) Foucar, pp. 140-44. (2) Roberts' Journal, p. 11. (3) Burmarmy Sitrep, 4 Apr 42. 12. (1) Rads London 2312, 2337, 3, 6 Apr 42. A47-136. (2) Speaking to MacMorland on 10 April, Col. Orde Charles Wingate, later the famous Chindit commander, forecast a withdrawal to northern and eastern Burma. MacMorland Diary, 10 Apr 42. (3) CM-IN 2166, Brereton to AGWAR, 7 Apr 42. 14. Ltr, Generalissimo to Stilwell, Lo, and Tu, 10 Apr 42. SNF-12. 15. Ltr, Generalissimo to unnamed addressee [Lin Wei], 12 Apr 42. SNF-12. 16. Ltr, Generalissimo to Lo, 15 Apr 42, Incl to Lo's account of the Burma Campaign. SNF-12. 17. Ltr, Generalissimo to unnamed addressee [Lin Wei], 20 Apr 42. Folder, CKS Corresp, First Burma Campaign, Stilwell Personal Papers. 18. Normal divisional organization called for 9 infantry battalions; at this time the 17th Indian Division included the remnants of 17. The 1st Burma Division with 7 weak battalions was badly understrength, but received 3 battalions from the 17th and 1 from the 7th Armored Brigade before it reached the Yenangyaung oil fields. Rad, New Delhi 49, 31 Mar 42. Stilwell Documents, Hoover Library. The Japanese had three regiments plus artillery, perhaps 15,000 men. Though the odds were not impossible, the defenders did not yet appreciate the importance of aggressive patrolling and co-ordinated attacks. Consequently, the Japanese could move almost at will through the gaps on the long front. 19. (1) Foucar, Ch. 17. (2) Roberts' Journal, pp. 14, 18-21. (3) The Campaign in Burma, pp. 36-43. (4) SEATIC Bull 245, 5 Oct 46, sub: History of Japanese 15th Army, pp. 24-25. 20. (1) Foucar, p. 158. (2) Belden, Retreat with Stilwell, p. 107. (3) Roberts' Journal, pp. 21-22. (4) Alexander Report, Supplement to The London Gazette, App. A. (5) Wyman Diary, 16 Apr 42. (6) The Stilwell Papers, p. 83. (7) Stilwell Diary, 12 Apr 42. 21. (1) Foucar, pp. 161-64. (2) Belden, Retreat with Stilwell, pp. 133-51. 22. (1) Foucar, pp. 164, 168. (2) The Campaign in Burma, p. 48. (3) Stilwell understood the 17th Division's demonstration to be a major thrust against the 33d Division's rear. Stilwell Diary, 18 Apr 42. 23. (1) The Campaign in Burma, pp. 48-50. (2) Belden, Retreat with Stilwell, pp. 152, 160-64. (3) Roberts' Journal, pp. 21-22. (4) Foucar, pp. 164-65, 167. 24. Ltr, Generalissimo to unknown addressee, 20 Apr 42. Stilwell Personal Papers. 25. (1) Stilwell told the Generalissimo that Yenangyaung was the sole cause of the abandonment of the Pyinmana plan and the subsequent Chinese withdrawal, not any action of the Chinese. Madame Chiang to Currie, quoting Stilwell's radio, Maymyo 68, 19 April 1942, verbatim. WDCSA 384 (4-28-42). The message is also quoted in The Campaign in Burma, p. 44. (2) CM-IN 4660, Stilwell to Marshall, 15 Apr 42. (3) Rad, Stilwell to SEGAC (The Generalissimo's, radio call station Chungking), 18 Apr 42. Stilwell Personal Papers. 26. (1) The Campaign in Burma, pp. 45-46. (2) Alexander Report, Supplement to The London Gazette, pars. 36, 45, 46. (3) Wyman Diary, 19 Apr 42. (4) The Stilwell Papers, pp. 89-90. (5) Stilwell Diary, 17, 18, 19 Apr 42. 27. (1) The Campaign in Burma, pp. 30, 33, 28, 11. (2) The Stilwell Papers, pp. 69, 71, 74. (3) Colonel Aldrich, the American liaison officer with the 6th Army, tells of attempting to persuade Kan to move. (4) Supply and Evacuation Plan for a Withdrawal, 4 Apr 42. Stilwell Misc Papers, 1942. This paper lists a drive through the Shan States as second among Japanese capabilities. 28. (1) French Indochina and Thailand Order of Battle Review, 1 Oct 45. MID Library. (2) The Stilwell Papers, pp. 85-87. (3) Brig John F. Bowerman, British Ln Off with 6th Army, Notes on Duties with the Chinese Expeditionary Force, Combat Rpts and Misc Ln Off's Rpts. (Hereafter, Bowerman.) ALBACORE Hist File, Northern Combat Area Command Files, KCRC. (4) Interv with Col Aldrich, 1948. HIS 330.14 CBI 1948. Colonel Aldrich knew Brigadier Bowerman, whose report is cited above, and considered him an excellent soldier and a careful observer. 29. (1) Japanese Study 88, Ch. IV. (2) Japanese Study 94, Ch. VI. 30. (1) Wyman Diary, 6 Apr 42. (2) Bowerman. (3) The Campaign in Burma, pp. 34-35. (4) Roberts' Journal, pp. 13-14. (5) Foucar, pp. 198-99. 31. (1) Ltr, Generalissimo to Stilwell, 8 Apr 42, appended to Lo's account of the First Burma Campaign. SNF-12. (2) Ltr, Generalissimo to Stilwell, 9 Apr 42. SNF-12. 32. Wyman Diary, 9 Apr 42. "The 56th Division will leave Loikaw on 20 April and advance through Laihka to the vicinity of Lashio in order to cut off the enemy retreat and prepare for the next operation. . . . The 18th Division will start from the east side of the Toungoo-Mandalay railway and advance to the eastern part of Mandalay and cut off the Mandalay-Lashio road. . . . The 55th Division will advance to the southwest part of Mandalay by first defeating the enemy west of the Toungoo-Mandalay railway, to smash the enemy main force at the Irrawaddy River. . . . The main body of the 33d Division will advance from the east bank area of the Irrawaddy River to the vicinity of Myingyan. It will then advance to defeat the enemy main force in the vicinity of Mandalay by outflanking the right wing of the enemy." 34. Stilwell Diary, 11 Apr 42. 35. (1) These recommendations are undated and are in Stilwell Misc Papers, 1942. (2) The Stilwell Papers, p. 87. 36. (1) Bowerman. (2) Interv with Aldrich. HIS 330.14 CBI 1948. 37. Stilwell Diary, 12 Apr 42. 38. Wyman Diary, 12, 14, 15 Apr 42. 39. (1) Bowerman. (2) The Campaign in Burma, pp. 39, 53, 63. (3) McCabe's and Aldrich's reports reached Stilwell through British signals to Maymyo. (4) Memo, Boatner, 30 Jul 42, sub: Rpt on Some Activities of 93d Div in Burma. SNF-21. 40. (1) The Campaign in Burma, pp. 53, 63, 50. (2) Foucar, p. 199. (3) Memo cited n. 39(4). 42. (1) Japanese Study 88, Ch. IV. (2) Map, Japanese Study 100, Annex 5. 43. (1) The Campaign in Burma, pp. 40, 52. (2) The Chinese Army in Burma. MIS Folder, Burma Campaign, MID Library. (3) Foucar, p. 199. (4) Roberts' Journal, p. 23. (5) Ltr, Aldrich to Sunderland, with notes, 18 Feb 50. HIS 330.14 CBI 1950. 44. Stilwell Misc Papers, 1942. 46. Memo, Roberts for Stilwell, 21 Apr 42. Stilwell Misc Papers, 1942. 47. Stilwell Diary, 21 Apr 42. 48. (1) The Campaign in Burma, pp. 52-55, 63-64. (2) The Stilwell Papers, pp. 90-92. 49. (1) Roberts' Journal, pp. 22, 24-26, 27-30. (2) The Campaign in Burma, pp. 54, 57, 59, 60-71. (3) Burmarmy Sitrep, 29 Apr 42. (4) Japanese Study 88, Ch. IV. (5) Foucar, pp. 173-80. 50. (1) The Campaign in Burma, pp. 53, 64, 74. (2) Foucar, p. 201. 51. Memo cited n. 39(4). 52. (1) The Campaign in Burma, pp. 41, 53, 54, 64, 74. (2) Roberts' Journal, pp. 24-26. (3) Foucar, pp. 171-201. (4) The Brereton Diaries, p. 124. (5) Wyman Diary, 26 Apr 42. 53. (1) The Campaign in Burma, p. 64. (2) Int Summary, AVG Activities for Apr 42, AVG Hq. AVG File, Gen Ref Br, OCMH. 54. (1) The Campaign in Burma, pp. 52, 58, 62, 67, 75, 83. (2) Stilwell Diary, 23, 25 Apr 42. 55. (1) The Campaign in Burma, p. 74. (2) Foucar, p. 74. (3) Ltr, Boatner to CG AAF CBI, 13 May 42, sub: Incidents Prior to and Immediately Following Fall of Lashio (April 20-29, 42). HIS 330.14 CBI 1950. (4) Ltr, Boatner to Chief, HD SSUSA, 14 Nov 47. HIS 330.14 CBI 1947. 56. Stilwell Diary, 16 Apr 42. 57. Memo, Stilwell for Generalissimo, 27 Apr 42, sub: Proposal to Organize and Train a Chinese Force in India. Stilwell Documents, Hoover Library. General Gruber opened and ended the proposal with a note that this was not presented as coming from the U.S. or British Governments. 58. (1) Gruber told Stilwell of this by a penciled note on lined paper with no date or sender's number. Stilwell Misc Papers, 1942. (2) ". . . Gruber reports complete success of his job. We to have complete direction of move (the staff is squabbling a bit)." Stilwell Diary, 29 Apr 42. 59. Operational Instruction 46, Army in Burma, 23 Apr 42. Stilwell Misc Papers, 1942. 60. (1) Alexander Report, Supplement to The London Gazette, pars. 47-49. (2) Bowerman. (3) The Campaign in Burma, p. 73. 61. (1) On 27 April 1942 the Chinese received orders from the Generalissimo to fight a mobile battle, to stay in Burma, and to hold Kengtung and the Bhamo-Myitkyina area. Lo's account of the Burma Campaign. SNF-12. (2) Ltr, Generalissimo to unknown addressee, undated. CKS Corresp, Stilwell Documents, Hoover Library. (3) The Stilwell Papers, p. 93. (4) Alexander Report, Supplement to The London Gazette, par. 54. (5) Wyman Diary, 30 Apr 42. (6) Stilwell Diary, 29, 30 Apr 42. 62. Rad, Stilwell to AGWAR, 4 May 42. Stilwell Documents, Hoover Library. 63. Sgts John and Ward Hawkins, History of the 835th Signal Service Battalion. Gen Ref Br, OCMH. 64. (1) Foucar, pp. 175-80. (2) The Campaign in Burma, pp. 74-75. (3) CM-IN 7935, Stilwell to AGWAR, 30 Apr 42. 65. The entry of 5 May in the Wyman Diary, "Possible presence of Japs at Bhamo dictated movement out of Burma via Imphal," with Stilwell's action of the same day in asking about a train to Myitkyina, seems to fix 5 May as the date that Stilwell elected to move out of Burma to the west. Had he made the decision on the 4th of May, he would not be asking about trains north on the 5th. The Stilwell Papers, pp. 96-98. 66. (1) See n. 57. (2) CM-IN 7490, Stilwell to AGWAR, 28 Apr 42. (3) MacMorland Diary, 25 Apr 42. (4) The Stilwell Papers, p. 94. (5) The Campaign in Burma, pp. 74, 75. (6) Memo, Gruber for Stilwell, 12 May 42. Folder, Operations-Burma Evacuation, Gen Ref Br, OCMH. 67. (1) Rad WAR 575, Marshall to Stilwell, 30 Apr 42. Paraphrased in Folder cited n. 66(6). (2) CM-IN 1606, Stilwell to Marshall, 6 May 42. 68. (1) Rad, Marshall to Stilwell, 18 Apr 42. AG 381 (12-19-41). (2) Rad WAR 570, Marshall to Stilwell, 29 Apr 42. (3) Rad WAR 336, Marshall to AQUILA, 12 May 42. Paraphrased in Folder, cited n. 66(6). (4) Cable, Mme. Chiang to Currie, 6 May 42. Folder 19B, OPD Exec 10. 69. Notes after Cabinet Mtg, 1 May 42. WDCSA 334-M, A46-523. 70. (1) Alexander Report, Supplement to The London Gazette, pars. 55, 61, 62. (2) Japanese Study 88, Ch. IV. (3) The Stilwell Papers, p. 97. 71. (1) Foucar, Ch. 21, p. 241. (2) Owen, Campaign in Burma, p. 26. (3) The Campaign in Burma, p. 76. (4) The Stilwell Papers, p. 97. Many of the missing were dead, who under conditions of jungle warfare had simply disappeared. Some 3,000 were members of Burmese units, many of whom had probably deserted. British and Indian units reported 6,000 missing in action. Of these, many were undoubtedly prisoners of war, and a great number of these unfortunates must have died in Japanese custody. The enemy was not meticulous in reporting such matters. 72. Hist Sec (India), India at War, 1939-1943, p. 113. Gen Ref Br, OCMH. The 2d and 5th British Divisions arrived in India from the United Kingdom that summer. The latter went to the Middle East after a brief stay. A great deal of ordnance was also received from the United Kingdom. 73. (1) Ltr, Brig Cawthorn, Dir of Mil Int, GHQ (India), to Gruber, 15 May 42; (2) Ltr, Gruber to Wavell, 16 May 42. Folder, Chinese Army, Trek from Burma, Gen Ref Br, OCMH. (3) History of CBI, Sec. II, Ch. V, p. 3. (4) Foucar, pp. 189, 201, 203. (5) The Campaign in Burma, pp. 82-87. (6) Wyman Diary, 8 Jun 42. "Gen. Sun's constant supervision of all matters pertaining to his troops is of the highest type." In a letter, Wyman to Stilwell, 17 June 1942, the former calls General Sun "a top soldier." Gen Ref Br, OCMH. (7) Lo's account of the Burma Campaign. SNF-12. 74. Chih Hui Pu Diary, p. 2. Folder, Chinese Army (Ramgarh), Gen Ref Br, OCMH. 75. (1) Ltr, Boatner to Stilwell, 23 Aug 42, sub: Rpt on Activities in Dibrugarh-Ledo-Tipang Area from 20 Jun to 16 Aug; MS, Evacuation of Burma, Folder, Chinese Army, Trek from Burma. Gen Ref Br, OCMH. 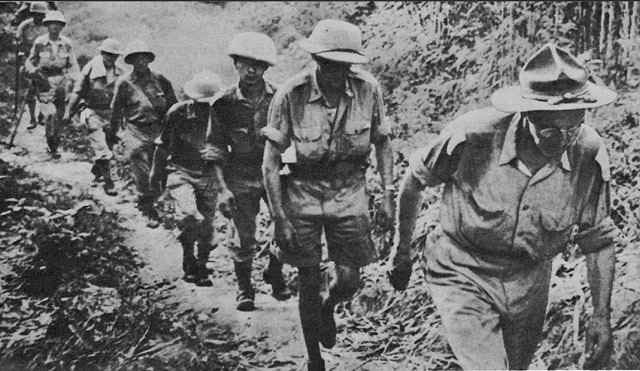 Evacuation of Burma appears to be a fragment of a long report by one of the officers sent up the trail. It gives the impression of a flood of horrors, perils, and adventures on such a scale that the author had neither the time nor inclination for fear or disgust. The extraordinary became commonplace, and he strove with it and recorded it as a matter of routine. (2) MA Rpt 655, 21 Sep 42. MID Library. 76. (1) The Campaign in Burma, pp. 86-87. (2) History of CBI, p. 35. 77. (1) The Stilwell Papers, pp. 99-103. (2) Wyman Diary, 1-20 May 42. (3) Ltr, Nowakowski to Sunderland, 13 Feb 50. HIS 330.14 CBI 1950. 78. (1) The Stilwell Papers, pp. 96-104. (2) Wyman Diary, 1-20 May 42. (3) Though Stilwell did not reach Imphal, capital of Manipur State, until 20 May, his party crossed the border at Saiyapaw on the 15th. History of CBI, p. 26. 79. (1) Foucar, pp. 206-08. (2) Statements of General Tanaka, General Takeuchi, Lt Col Taro Hayashi, and Col Motohisa Yoshida. Gen Ref Br, OCMH. (3) Japanese Study 88, Ch. IV. (4) MacMorland Diary, 8 May 42. MacMorland quotes Chennault assaying that the AVG had stopped an invasion. 80. (1) Japanese Study 88, Ch. IV. (2) The Campaign in Burma. 81. 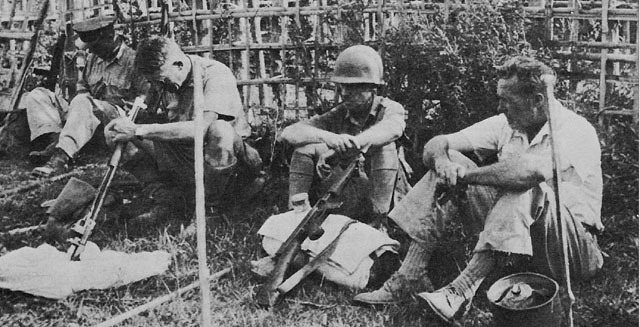 The preceding passage on the withdrawal of the Chinese Expeditionary Force from Burma is based on Japanese Study 88, and the Campaign in Burma, pp. 24, 80-89, 91. 82. Rpt, With the 200th Division Withdrawing into China, translated by "P. F." SNF-21. 83. Sources cited n. 81. 84. Japanese Study 88 speaks of fighting the 71st Army (heroes of Shanghai fighting in 1937) along the Salween. It states the Chinese counterattacked, and that the 56th Division "checked" these attacks. 85. Int Summary, AVG Activities for May 42, Hq AVG. AVG File, Gen Ref Br. OCMH. 86. The New York Times, May 15, 16, June 2, 1942. 87. (1) Japanese Study 100, sub: Summary of Progress of Operations by 15th Army. (2) In a postwar survey, U.S. Strategic Bombing Survey Report 64d, Ground Logistics. (9) Statistics of Losses, the Japanese losses show 9,600 battle casualties including 7,400 killed in action and 500 dead from wounds received in action. This report is in the National Archives. (3) The Campaign in Burma, pp. 90-91. 88. Stilwell Diary, 10 May 42.